Are you expecting company and wish you had something to haul out of the refrigerator so you could enjoy their visit? That’s usually called “leftovers.” But what if you had two recipes that actually benefitted from sitting for a day in the ‘fridge? These two fit the bill perfectly. This post is about a recipe that has become a staple in my kitchen. I’ve been making Chicken Marengo for too many years to count. It’s a delicious dish that you can make and eat right away, or refrigerate and let the flavours meld together. It’s actually better the second day. I usually make this when I’m not expecting company and then we have enough for an excellent quick meal a few days hence. Marengo is an actual place in Piedmont in what is now Italy. 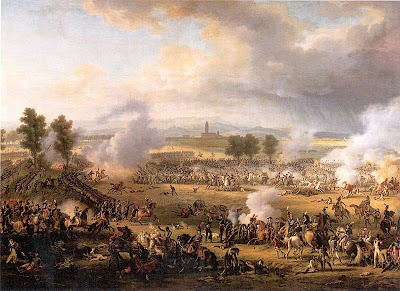 In 1800 a battle was waged between Napoleon’s forces and those of Austria. At the end of the day Napoleon won. The story goes that his camp chef was left to forage the surrounding area for dinner ingredients for the First Consul. He came back with a chicken, onions, mushrooms, olives and tomatoes. These would have been common ingredients to find in the area. 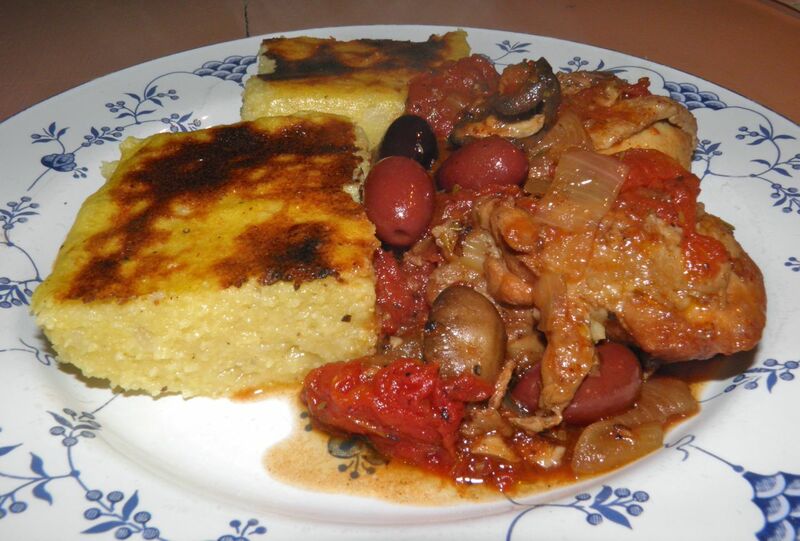 That was the invention of the dish named after the battlefield, now called Chicken Marengo. Who knows if it’s true or not. It's a charming tale, but does it really matter? The important thing is that someone created it. There are many versions floating around, but I do have to say that mine is tasty and reliable. It’s easy to make and always turns out perfectly. I usually serve it with rice, but for a change I opted for polenta. That decision gave me another vegetable in the meal. 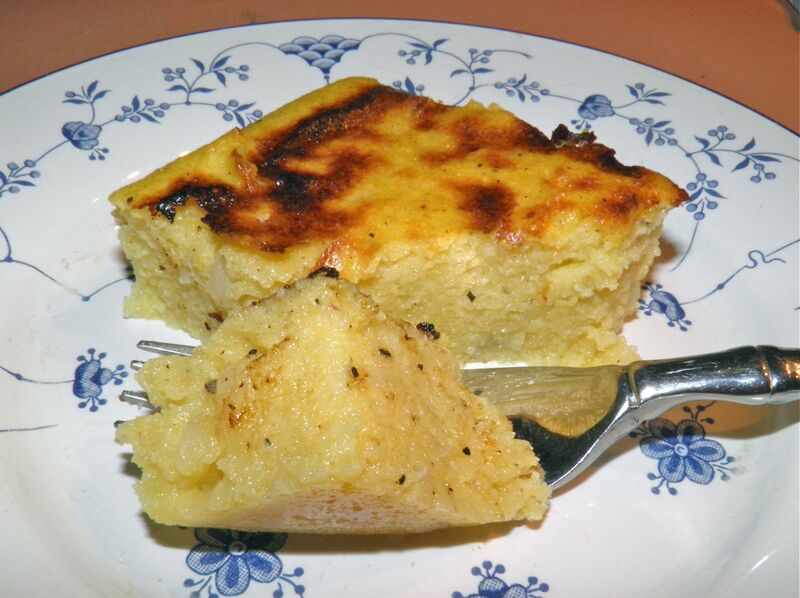 Polenta is cornmeal cooked with stock and cheese into a creamy mixture that sets up to a firm cake. What makes this recipe savoury is the inclusion of a fried onion. 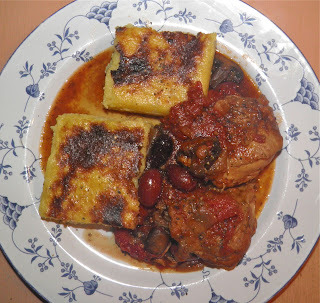 Polenta is a dish that has uses in many, many cultures. It is a fixture in the cuisines of Europe, North and South America, Africa and the Caribbean. Both recipes refrigerate very well. In fact, many polenta recipes require refrigeration to ensure the mixture sets up properly so it can easily be cut into squares for serving. This all takes a while, but if you’re doing it the night before you can enjoy your evening while the chicken simmers for the hour. So it’s by no means something that requires constant supervision. Heat the olive oil in a deep skillet or dutch oven. Fry the chicken. Place it skin side up first. Sprinkle with salt and pepper. Fry until the chicken releases from the pan. Flip and brown the tops, once again until the skin releases from the pan. Slice the mushrooms in half, or quarters depending on size. The desired result is large pieces. Add the onions to the fat in the pan and sauté until they begin to soften. Then add the mushrooms and sauté until they become soft. Throw in the red wine to deglaze the pan. Add the garlic and sauté for a further few minutes until most of the wine has evaporated. Stir in the tomatoes with their juice. Break them up with a wooden spatula into large pieces. Stir in the thyme. Add the chicken back into the pan and submerge it in the liquid. Cover but leave the lid ajar to allow some evaporation. Let it cook for 1 hour. 15 minutes before the hour is up stir in the kalamata olives. Let cool and refrigerate overnight or serve it right away if desired. But it’s even better the next day. Sauté the onion in the olive oil until it begins to brown. 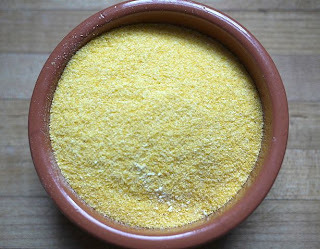 Add the cornmeal and stock. Cook, whisking constantly, until it becomes very thick. Cook for a few minutes longer. Remove from the heat and stir in the cheese, salt and pepper. Pour into a pan and refrigerate for at least 1/2 hour, or overnight. If refrigerating overnight, press some plastic wrap onto the surface. Let the polenta come to room temperature. Just before serving run under the broiler, about 8” from the heating element, until browned.